President Trump could soon kill a major trade deal with Mexico and Canada if huge compromises aren't made this week. No major progress has been made on key issues through the first five rounds. Only one more round after this week is scheduled, and Trump continues to repeat his threat that if he doesn't get the deal he wants, he'll withdraw. "It's going to be the decisive round," says Scott Sinclair, senior fellow at the Canadian Centre for Policy Alternatives. ....The Wall will be paid for, directly or indirectly, or through longer term reimbursement, by Mexico, which has a ridiculous $71 billion dollar trade surplus with the U.S. The $20 billion dollar Wall is "peanuts" compared to what Mexico makes from the U.S. NAFTA is a bad joke! Related: The stock market is on fire: What could possibly go wrong? Negotiators face a number of challenges this week. Mexican presidential campaigns kick off in March and the election is in July. Mexican leaders have long warned that they can't ratify a new agreement in Mexico during election season. President Enrique Peña Nieto can't run due to term limits, and his party's opponent, Andres Manuel Lopez Obrador, known as AMLO, is leading by a wide margin in the polls. AMLO has promised to get tough on trade with Trump and completely restart NAFTA talks. If elected, he would take office in December. On top of that, U.S. midterm elections take place this fall. It'll be hard to ratify a new deal in the United States as that vote draws near. "There are Mexican politics just as there are American politics. So far on trade, the Trump administration doesn't seem to be playing either well," says Phil Levy, senior fellow at the Chicago Council on Global Affairs. Economists long warned that the Trump administration's timeline was unrealistic to get a new deal done. On top of elections, there are several bureaucratic steps the Trump administration and Congress must take before ratifying NAFTA, according to U.S. trade laws. Many experts say the most likely scenario is that NAFTA talks get kicked way down the road to 2019. But among the other two alternatives -- striking a deal or killing it -- there's no doubt what has better odds. "It's far more likely that the president decides to blow it up than you get a conclusion," adds Levy. "I think it's extremely unlikely you get a positive outcome out of" Round 6. The number-one issue on the negotiating table involves how and where cars are manufactured in North America. Under the current NAFTA, 62% of the parts in a car sold in North America must come from the region. It doesn't matter if the parts come from Canada, Mexico or the United States. They just need to be sourced from within the continent. Trump's trade team wants to raise that threshold up to 85%. The caveat: Trump's negotiators are proposing that half of auto parts sourced from North America come specifically from the United States. The rest would go to Mexico and Canada. In other words, the Trump administration is asking for half of the pie, while Canada and Mexico would presumably each get a quarter. Mexican Economy Secretary Ildefonso Guajardo told CNNMoney last April that a U.S.-specific rule would be unacceptable. In November, Canadian Foreign Minister Chrystia Freeland referred to this as one of Trump's "extreme proposals" that "we simply cannot agree to." 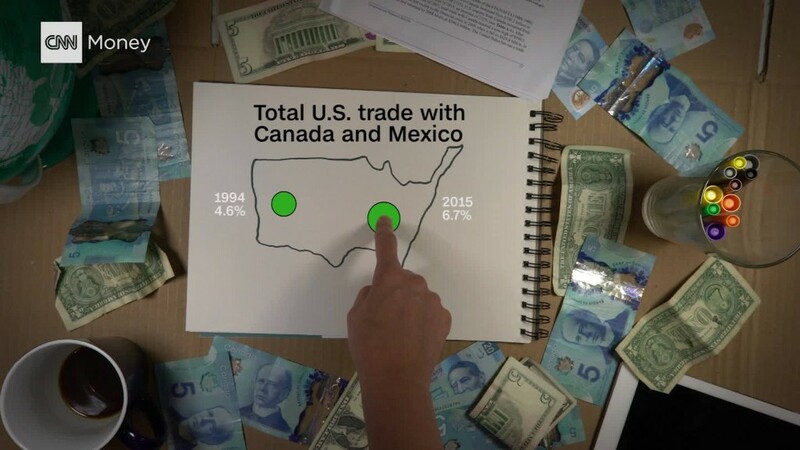 Cars are such a big deal because the amount of vehicles and auto parts that come into the United States from Mexico make up the vast majority of the U.S. trade deficit with Mexico. And Trump's top priority for a new deal is one that hacks away at the deficit. Tom Donohue, CEO of the U.S. Chamber of Commerce, said in October that the Trump administration has "several poison pill proposals" for NAFTA. One of them is the so-called sunset clause. Under that proposal, NAFTA would terminate every five years unless all three countries agreed to sign on for another five years. Mexico and Canada say this is another deal breaker. Some outside experts argue that the sunset clause proposed by the Trump administration would cause too much uncertainty for businesses trying to invest long-term in Mexico or Canada. Guajardo, Mexico's top negotiator, has said he will propose an alternative of reviewing the economic impact of NAFTA every five years, but he can't agree to an automatic termination. Whether negotiators make those types of compromises this week is exactly what needs to happen for NAFTA to survive, experts say. "The thing to watch for is -- is there any sign that they're moving towards negotiable positions?" says Levy. Or more bluntly, "Are they even on the same page?"